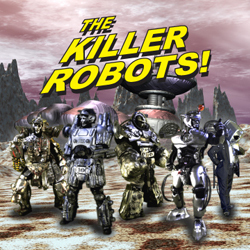 The Killer Robots Return From Supercon | The Killer Robots! The Killer Robots had a blast at Florida Supercon this past weekend. We screened The Killer Robots! Crash and Burn for some enthusiastic audiences, took pictures with a lot of nice people, promoted our July 15th iTunes release (http://apple.co/28Ti8XG) and made lots of new friends! Oh, and we also won a Laurel for Best Fantasy in the Supercon Geek Film Festival! Congrats cast and crew!! Big thanks to Kurt, Sam and Josh for their hospitality and help! It’s always a challenge to lug a bunch of robot parts around an an event and we were lucky to encounter some cool staff to lend a hand and some behind-the-scenes support. We’re firing up the marketing engines for the July 15th iTunes release. Check back this week for more developments, contests and videos! In the meantime, be sure to check out this cool review of the movie by Mat Smith of Documentary Evidence! Met you all at Supercon. You are a class act! Inventive, genuine and genius! All the best gentlemen. PS. Loved the movie. Thanks for the kind words Chef! It was great to meet you. Glad you enjoyed the movie!